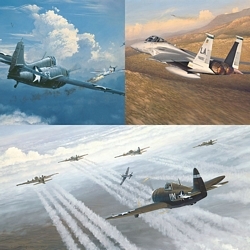 Image Size: 36"w x 7 5/8"h.
In the grand tradition of his "Thunder in the Canyon," "Into the Throne Room of God" and "Those Last Critical Moments" (all Sold Out at Publisher), William S. Phillips returns to the skies in "Phantom Thunder." From the thrill of lift-off to the extraordinary exhilaration of in-flight action, Bill is truly a master of the aviation art world. The artist presents us with an awe-inspiring panorama that pays tribute to a pair of American heroes.